On the night of February 2nd, 2017, a Mooney M20M departed Duluth, MN for Winona, MN. At approximately 8:00pm radar contact was lost with the aircraft and the FAA reported the aircraft missing at 8:15pm. At approximately 9:10pm a 911 call was received from a homeowner in Ellendale, MN stating that an aircraft had crashed nearby and the pilot had walked to the residence for help. The pilot was seriously injured and the aircraft was significantly damaged, but the results could have been a lot worse considering. The exact circumstances that led to the crash are still under investigation, but the spouse of the pilot confirmed that he was being treated for carbon monoxide poisoning at the hospital in the days after the crash. Carbon Monoxide (CO) remains one of General Aviation’s most significant hidden dangers. CO can enter the cabin and incapacitate a pilot or crew with almost no discernable warning and can render a person unconscious with toxic levels in minutes. The odorless and invisible gas can enter a cockpit through heater systems, faulty door seals, holes in the firewall, cracks in the exhaust system, and even leaky gear wells channeling exhaust inside. Once it is inhaled by the pilot, CO blocks oxygen absorption by hemoglobin in the blood and rapidly presents symptoms resembling hypoxia and can lead to unconsciousness or even death. Though death directly from CO may be unlikely in an aircraft cabin, the incapacitation caused by it can lead to loss of control in an aircraft with serious and, many times, fatal results. The pilot in the recent crash in Ellendale was extremely lucky. Guardian Avionics, a leader in Carbon Monoxide detection for General Aviation, manufactures solutions to accurately detect and warn pilots of the presence of CO in the cabin for FAA certified aircraft like the Mooney featured above. For owners of older aircraft models or rental aircraft, Guardian Avionics has several new options to provide reliable and lower cost protection for the GA community. The new Aero 451 Carbon Monoxide Detector is the first CO detector authorized for permanent installation in a certified aircraft under the new NORSEE (Non-Required Safety Enhancing Equipment) program by the FAA and can be installed in any Part 23 aircraft or Part 27/29 helicopter with only a “Minor Alteration” logbook entry by an A&P or IA. The Aero 451 begins detection of CO as low as 35 Parts Per Million (PPM) and provides an aural alarm and amber warning light at levels of 50-99 PPM and an alarm and red warning light for CO levels above 99 PPM. The 451 may be installed as a panel mounted unit or as a remote mount unit and the highly accurate CO sensor has a life span of 7 years. The Aero 451 is priced at $399.00. For pilots that fly rental aircraft or multiple aircraft, Guardian Avionics has reintroduced the Aero 152A-WD Portable Carbon Monoxide Detector that plugs into, and is powered by an aircraft cigarette lighter socket. Using the same sensitive CO sensor technology that all Guardian Avionics detectors use, the 152A-WD provides an aural alarm as well as alert and warning lights for CO levels from 50 PPM to 99 PPM and above 99 PPM respectively. This affordable and budget-friendly option is simple protection for a pilot that cannot install a permanent CO detector in the aircraft. The Aero 152WD is priced at $169.00. 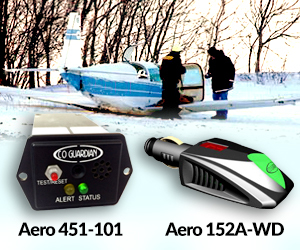 Guardian Avionics is the trusted name in Carbon Monoxide detection for many leading manufacturers of General Aviation aircraft. 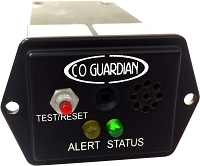 Guardian Avionics CO detectors are installed as standard safety equipment in all new Cessna, Cirrus, and Diamond single-engine piston aircraft and are a popular option in new Piper piston aircraft. Based in Tucson, Arizona and established in 1999, Guardian Avionics / CO Guardian is a leading provider of Carbon Monoxide detectors, iPad/iPhone panel mounts, USB power supplies, and connected cockpit solutions for General Aviation ranging from portable units to FAA TSO certified models. Guardian Avionics products are featured as standard safety equipment for new aircraft from OEMs including Cessna Aircraft Company, Cirrus Aircraft, Piper Aircraft, and Diamond Aircraft Industries. For more information, please visit www.GuardianAvionics.com or contact by phone at 520-889-1177.